Sunderabai Kshirsagar first came to Shirdi from Pandharpur with Baba’s devotee Nanasaheb Chandorkar. She became devout follower of Baba. She surrendered to Him fully with all her mind & heart. She would continuously chant the God’s name, “Radha-Krishna” so much so, that people started knowing her by the name Radhakrishna Aai (Aai Means Mother). They almost forgot her real name. She used to do all possible seva to Baba; & inspired others to do so. She was a young widow. She would never show her face to Baba. She never climbed the stairs of Dwarakamai. Baba would sleep in the Chawadi on alternate days. Only on those days she would go to Dwarakamai to place lighted rock-oil lamp (Kandir) on the stairs & return. She used to wear only white saris, which Baba used to provide her. He also used to send some eatables (Part of alms & Naivedyam received) to her at the hands of Madhavrao Deshpande. Baba had told him (Madhavrao) that she was there with Him in some previous birth. Under Radhakrishna Aai’s management, offering Arati to Baba was started as a regular ritual. Arati would be offered three times a day. “Kakad Arati” at dawn, then afternoon Madhyan Arati & Shej Arati at Night. At the time of Arati, devotees would hold Umbrella, Fan & other such things in honour of Baba (Chhatra, Chamar, Chavari, Abdagir etc). Radhakrishna Aai did immense efforts to change the face & ambiance of Shirdi. Shirdi village was transformed into Shridi-Sansthan. Fakir-like humble appearance of Shirdi was changed & it shone with a new splendour. She got the Chawadi decorated with Glass Candle-holders, Chandeliers, Mirrors & Photo Frames. When Baba would be on His way to Chawadi, there would be music, a horse (it was named as Shamsundar) & a palanquin. The devotees would accompany Baba singing Bhajans (Devotional Songs). She used to send rolled Betel-leaves (Govind-Vida) everyday to Baba. Baba would eat smashed Vida sent by her. She believed that Baba was Krishna. So she started Gokul-Ashtami (Birthday of God Krishna) Festival in Shirdi). She was a Krishna Devotee. She had a small idol of Krishna. It was made up of some metal. She used to carry it with her all the time. She would not leave it even for a second. She might be Radha in her previous birth. Devotees of Baba used to serve her too. She was young in age, but all would respect her & act as per her wish & instruction. • She would clean the surroundings of Dwarakamai & sweep all the roads, which Baba used. • She would bring butter, cashew, almonds, laddu, roti, milk & yoghurt etc., for Baba as breakfast. • She would keep hot water ready for Him to clean the teeth in the morning. • For lunch, she would send rawa-halwa, Payasam (Khir) & Pakodas together with subji, chatni etc., in silver plates. • In the evening again she would send different eatables & drinking water in silver jug with spout (Zari). • She brought all silver utensils need for Baba’s worship, big bowl (Gangajal) for His Bath & a few other things like glasses, trays, perfume bottles & rose water sprinklers. • She brought soft mattresses, pillows etc., for Baba to sit & sleep on. • Baba used to go to Chawadi on alternate days. She started custom of daily procession from Dwarakamai to Chawadi. A palanquin, a chariout (on every Thursday) were included in the procession by her suggestion. • With the help of Purandare Kaka, she got some arches set on the way by which Baba would pass. The arches were then covered with some creeper plants as decoration & making shade on the way. • She adorned Dwarakamai with beautiful curtains. • She designated some people to accompany the procession as Bhaldar & Chopdar. She decided & made the unifors for them. She bought silver sticks to be held by them while walking by the side of Baba. • She arranged petromax lamps which were necessary for the procession. In these & many other ways Radhakrishna Aai added to the splendour of Baba. 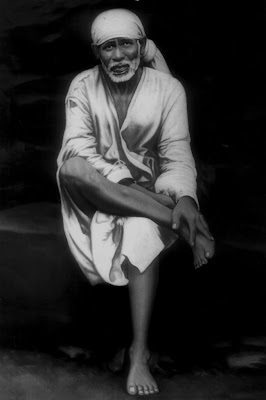 With the help of Baba’s close devotees she implemented the process of making Shirdi a Sansthan. Her stay in Shirdi was not more then nine years or so. But in that short span of time she brought about many good changes in Shirdi. Her life is nothing less than the “RADHA-VILAS” for Lord Krishna. Extract from SHIRDICHE SAI BABA (Pp 230, 231) by Dr. Keshav Bhagwant Gawankar (Annasaheb Gawankar) English Translation by Mrs. Sangeeta Joshi. Publisher: Dr. Sainath Keshav Gawankar, Kurla (West).